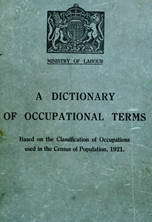 general term for any person engaged in, or skilled in, agriculture, either in theory or practice; term seldom applied to manual workers. Scottish term, rents dairy stock of farm, with, pasture and fodder, paying rent out of its produce; or gives labour as his share and divides profits with proprietor of stock. breeds and rears pigs on a farm or small holding; usually works himself and directs one or more labourers in grinding cereals, pulping roots and otherwise preparing foodstuffs, cleaning pig sties, putting pigs out to graze, tending sows in farrow; attends market for buying or selling of foodstuffs and stock; may cultivate on farm roots and cereals for foodstuffs. a dairy farmer (q.v.) who keeps cows for the production of cheese; supervises cheesemakers in dairy (022). a skilled independent agricultural worker, who takes work by contract. Scottish Highlands and Islands; "tenant of a holding, being arable or pasture land, from year to year, who resides on his holding, the annual rent of which does not exceed £30 in money, and which is situated in a crofting parish" (vide Crofters' Holding Acts); in many coastal districts and on some islands is partly dependent upon fishing. cultivates cereal and other crops and/or raises animals or birds for food on a tract of land, owned or leased for the purpose; usually, according to climate, produces annual crops of wheat, oats and other cereals, turnips, beet and other roots, clover, grasses and other green cattle foods, hard and soft fruits; also raises herds of cattle, flocks of sheeps [sic], etc., on grazing land, and breeds and maintains horses for work on the farm; breeds poultry of various kinds for eggs and table birds; directs workers engaged on various farming operations, e.g. ploughing, harrowing, sowing, planting, manuring, hoeing, weeding, reaping, carting, stacking, threshing, lifting and storing of root crops, pruning and spraying of fruit trees, feeding and care of cattle, sheep, poultry; attends at various markets for purchase or sale of produce, animals, seed and equipment; frequently assisted by farm bailiff or foreman (015) (q.v. ); often specifically designated according to branch of agriculture, e.g., cattle farmer, chicken farmer, dairy farmer, fruit farmer, poultry farmer, sheep farmer, stock farmer. a farmer (q.v.) who keeps cows for production of milk for market; may also make butter and cheese. breeds pheasants and other game birds for sporting purposes; sells eggs and young chicks to estate owners; is interested in improvement of strain and production of new types; shows birds at poultry shows. rears and keeps poultry, i.e., chickens, ducks, geese, turkeys, etc. ; sells eggs and birds to dealers; may also kill birds before selling and pluck and dress the bodies. a farmer (q.v.) who breeds thoroughbreds or hackneys in conjunction with carrying on ordinary farm work; usually grows and stacks hay and oats for consumption on farm. puts cattle to graze on pasture land but does not breed nor (as a rule) fatten them. a farmer (q.v.) who specialises in growing hops; directs work of hop ground labourers (024) (q.v.) and superintends drying of hops in oast house. a farmer (q.v.) who specialises in growing potatoes for market. see farmer, poultry; sometimes specifically designated, e.g., duck breeder, turkey breeder. cultivates plants, cereals, etc., on a farm; collects seed and sells to seed dealers; ploughs, harrows, rolls, drills and hoes; cf. seed grower (013). a farmer (q.v.) who farms a holding or small piece of land not exceeding an annual rental value of £50, and usually not exceeding fifty acres in extent. Cumberland and part of Northumberland, see yeoman; obsolescent. a cattle farmer (q.v.) engaged wholly or mainly in raising cattle. a farmer (q.v.) who grows strawberries for market; propagates plants by layering runners; lays straw round plants before fruiting to protect berries. a grazier (q.v.) who takes cattle or sheep in agistment, i.e. receives cattle and sheep for grazing in return for fee. (Cumberland and part of Northumberland) a farmer (q.v.) who owns and cultivates small farm.